The United States warned today that it would use its presidency of the UN Security Council to review the performance of peacekeeping missions worldwide. NEW YORK: The United States warned today that it would use its presidency of the UN Security Council to review the performance of peacekeeping missions worldwide. The council is due to vote in the next few days on whether to extend or to cut back the 19,000-strong UN mission in the Democratic Republic of Congo. And US President Donald Trump made it clear in his first budget request to Congress that he hopes to cut America's funding to the United Nations. US ambassador Nikki Haley will become president of the council for the month of April, and she made it plain that peacekeeping will be under the microscope. 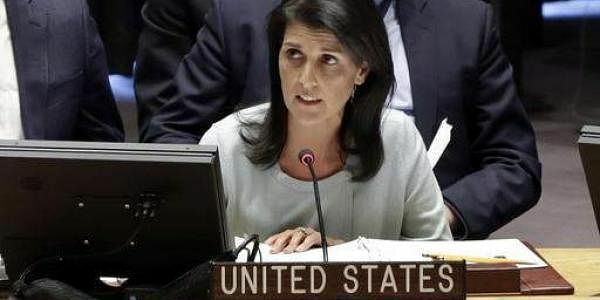 "I came to the UN with the goal of showing the American people value for their investment in this institution," she told the Council on Foreign Relations. Haley insisted that Washington's aim was to make the missions more effective and with a clear exit strategy, not only to save money. But she was clear that the US share of the USD 7.9 billion UN peacekeeping budget would have to fall from 29 to at most 25 per cent. "The United States is the moral conscience of the world," she said. "We will not walk away from this role, but we will insist that our participation in the UN will honor and respect this role." Haley said she had already begun work with UN Secretary-General Antonio Guterres to identify ways to streamline UN military commitments. "We're going to wind down the peacekeeping mission in Haiti, it's not needed anymore," she said. Guterres has proposed ending this mission by October. "We're going to wind down in the Ivory Coast. We're going to wind it down in Liberia. But guess what? We're going to work harder on those areas that truly don't have peace." But the next mission to be reviewed will be the biggest, that in the DRC. A vote on renewing its mandate had been due today, but has been put back. Some, including permanent council member France, have warned against dramatic cuts to the mission, with the country still in political and military turmoil. But Russia has endorsed the idea of a smaller force, and Haley's remarks to the CFR were a stark warning about its performance so far. "In the Democratic Republic of Congo, for example, the government is corrupt. It preys on its citizens," she said. "At the same time, the UN peacekeeping mission is mandated to partner with the government, to consolidate peace and security," she said. "In other words, the UN is aiding a government that is inflicting predatory behavior towards its own people. We should have the decency and the common sense to end this." The dangers facing the DRC were underlined this week when two UN contractors -- American Michael Sharp and Swedish-Chilean Zaida Catalan -- were found dead after going missing while conducting an expert study. The country is due to go to the polls before the end of the year, and Guterres has asked for a small increase in UN police numbers rather than a cut.